One of the main ways that informational texts differ from narrative literature texts, aside from the veracity of their content, is that informational texts have key recognizable features that can clue readers in to the fact that they are reading something that is intended to inform. We are all familiar with these features: table of contents, glossaries, indices, photos and realistic illustrations, etc., but it is likely that our students are completely new to the medium. As early as the first grade, the Common Core State Standards expect children to be able to recognize these features and know how to use them. One way to familiarize students with the features is to scan the pertinent pages of an informational text that show the different features, and have students read along with their own copies of the book. You can present the pages in diagram form, labeling things such as headings, illustrations, and the index, and test the students on their knowledge with a worksheet with blank labels. An example of a bare-bones version of this is below. ~ Ask and answer questions about key details in a text. ~ Identify the main topic and retell key details of a text. ~ Describe the connection between two individuals, events, ideas, or pieces of information in a text. ~ Ask and answer questions to help determine or clarify the meaning of words and phrases in a text. ~ Know and use various text features (e.g., headings, tables of contents, glossaries, electronic menus, icons) to locate key facts or information in a text. ~ Distinguish between information provided by pictures or other illustrations and information provided by the words in a text. 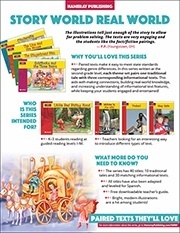 ~ Use the illustrations and details in a text to describe its key ideas. ~ Identify the reasons an author gives to support points in a text. ~ Identify basic similarities in and differences between two texts on the same topic (e.g., in illustrations, descriptions, or procedures). ~ Ask and answer such questions as who, what, where, when, why, and how to demonstrate understanding of key details in a text. ~ Identify the main topic of a multiparagraph text as well as the focus of specific paragraphs within the text. ~ Describe the connection between a series of historical events, scientific ideas or concepts, or steps in technical procedures in a text. ~ Determine the meaning of words and phrases in a text relevant to a grade 2 topic or subject area. ~ Know and use various text features (e.g., captions, bold print, subheadings, glossaries, indexes, electronic menus, icons) to locate key facts or information in a text efficiently. ~ Identify the main purpose of a text, including what the author wants to answer, explain, or describe. ~ Explain how specific images (e.g., a diagram showing how a machine works) contribute to and clarify a text. ~ Describe how reasons support specific points the author makes in a text. ~ Compare and contrast the most important points presented by two texts on the same topic. When introducing your students to informational texts, you'll want to choose topics that both have all or most of the informational text features and will also be interesting to students. One way of finding topics that will interest them is to choose books that draw from and expand upon things the students are already familiar with. Another way is to find topics that they may have recently heard or read about through exposure to narrative texts. These first informational texts should be bright and captivating, with pictures—illustrations and especially photographs—that draw students in. Where possible, the photographs should feature children, though this won't be applicable to every topic, of course. The informational texts should be at the correct reading level, with lines of text broken up into bite-sized chunks at sentence or phrase boundaries, with enough space between the letters and words that fledgling readers will not have trouble making them out. While Hameray's new series Real World was designed to pair with the Story World series (narrative texts), they can stand just as well on their own as terrific informational texts. The topics are diverse enough that there will be something of interest for almost every young reader, from animals to the water cycle, and from baking to ball games. This also allows them to be worked into various teaching units throughout the school year. Disciplines covered span from the sciences to the arts and beyond. The Story World-Real World series was specifically tailored to help students meet these Common Core standards, and the free Teacher's Guide (available for download in June) will include many ideas to support teaching informational texts. Below are example lessons extracted from the Story World-Real World Teacher's Guide for one of the books in the set of informational texts intended to support the traditional tale Cinderella. ** The book is called What's the Time?, and it is about different ways of telling time and where you can find clocks. There are many more activities and lessons in the teacher's guide; this is just a sample. There's a flip book of the title below the lesson. Example Lesson: What's the Time? If you are doing a shared reading, read the text with the children, spending time on the photographs and illustrations as well as the text (CCSS Reading Standards for Informational Text Grade 1 #7). For guided reading, decide on a specific learning focus: for example, vocabulary (reading, saying and understanding new words), or informational text features, or science information and concepts. Reread pages 4–5: Can we see our own shadows? Use a light to act as the sun. Have a student stand in one place. Shine the light on the student so he or she casts a shadow. What happens if we move the light around the student? (The student’s shadow moves.) What have we made? (A human sundial!) Talk about the students’ shadows when they are out in the sunlight on a sunny day. Why is it that sometimes our shadow is front of us and sometimes it is behind us? Why do shadows seem to get smaller towards the middle of the day and then longer in the afternoon? Reread pages 12 – 13. Ask the children to count how many clocks they have at home. Are there any clocks on public buildings in your town or city? How many clocks can they find in the classroom? (Don’t forget computers.) In the school? Why do we need so many clocks? This was a sample lesson from the Story World-Real World Teacher's Guide. The suggested text is meant to help guide the discussion and facilitate interactions, but is in no way meant to dictate exactly how a lesson is taught. Features of What's the Time? Supports integrated curriculum learning – literacy learning (reading informational texts: (CCSS Reading Standards for Informational Text Grade 1), plus science (Physical science: measurement, light and shadows, gravity). To see all titles available in the series, you can visit our website or take a look at our brochure for the series or download the series highlights by clicking on either below. *All information regarding the CCSS comes directly from the Common Core website and can be found in the downloadable PDFs available on that site. ** Because this is a sneak-preview of the forthcoming Teacher's Guide, which is still in draft form, the final downloadable Teacher's Guide soon available may deviate slightly from what is presented here.